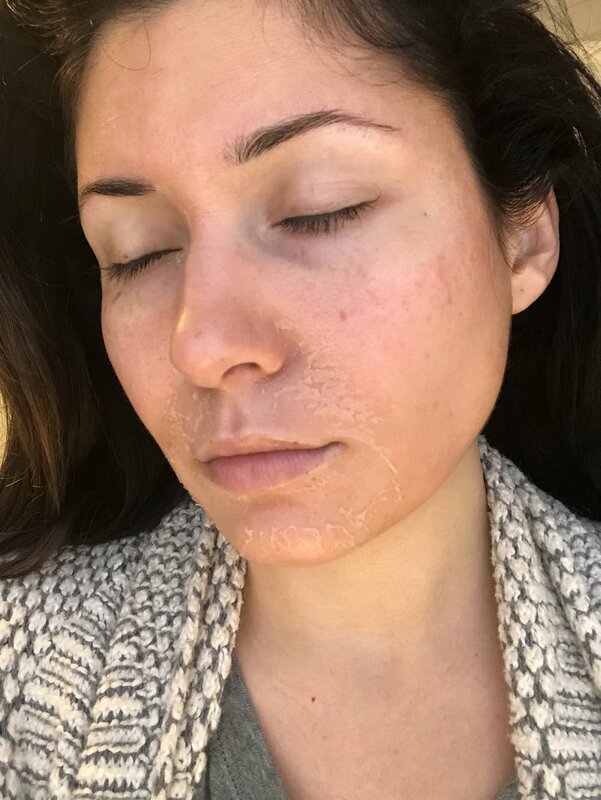 I recently had a medium depth medical grade professional peel performed by an amazing woman name Tina Marie here in San Diego. It’s called The Perfect Derma Peel and is a combination of several acids (TCA, retinoic, salicylic, kojic, vitamin C, glutathione and phenol) and antioxidants to work synergistically for a beautiful effect. I have to say it was really nice to be the client for a change! For me personally, I wanted to address my main concern being hyper-pigmentation. I grew up with Las Vegas where it’s basically 432 degrees and spent much of my teenage years floating around on a raft in my pool so I can go back to school with a golden tan. Also, I have been feeling a little dull so I felt it was time for some resurfacing to help with my texture, tone, pores and overall anti-aging. The entire peel is a three-step process - the first step is in-office and the other two post peel steps I applied at home on day 2. I went to Tina’s medical spa at lunch and was in and out in 20 minutes. She cleansed my skin with a gentle cleanser, applied a thin layer of acetone to remove any excess oil and will help the peel penetrate deeper (this is a pretty standard practice for many peels) and then applied a few layers of the peel. It felt slightly warm, numb and did not burn at all. Tina applying the peel to my skin. Right after application - slightly pink. The morning of day 2 I woke up feeling tight and dry and I was thankful to be able to wash my face with the gentle cleanser. I then wiped my face down with the Post Peel Towelette, let it dry/absorb for 30 minutes and applied some sunscreen and off to work I went. The Post Peel Towelette is saturated with vitamin C, retinyl palmitate and glutathione. For the most part I just felt tight and dry all day. That evening I cleansed my skin, applied the second Post Peel Towelette and headed to bed. On the third day is when the start of skin peeling is expected. I woke up looking pink and with some slight peeling around the corners of my nose and mouth. This was expected, the peeling often starts around the mouth since that is the most movement and stretching of the skin from talking or eating. The pinkness was caused by the vitamin C in the Post Peel Towelette which is sort of an orange-y color. By the end of day 3 I was peeling a bit more around my mouth and nose. Day 3 Morning - Peeling has started around my mouth and nose. Day 3 Evening - 12 hours difference! I knew the peeling would be in full effect by day 4 and 5 so I planned for those days to be the on the weekend. I noticed my hyper-pigmentation became darker on these days and the peeling extended from just my mouth and nose area to my cheeks and the center of my forehead. None of this peeling caused discomfort besides a little itchiness from the dryness but it was slightly strange seeing dead skin hanging off my face out of the corner of my eye! Overall I just let my skin do it’s thing and stayed away from my husband who was scared of me. HA HA! Since much of the peeling happened during this time I did start to notice my fresh new baby skin reveal itself as my skin shed. I WAS SO EXCITED! I was also allowed to cleanse my face with the wet cotton gauze Tina provided to very gently help the peeling process along and remove some of the hanging dead skin. I finished with the Post Peel Moisturizer which was a very gentle green tea based formula. Day 4 - Mouth, nose and then cheek peeling! Day 5 - Peeling has extended to my forehead area. On day 6 I went to work and graced my co-workers with my peeling presence. By this point I was peeling around my cheeks, near the outer part of my eyes and my forehead. I was still gently cleansing with the cotton gauze and using the Post Peel Moisturizer and sunscreen. I brought both products with me to work and applied the moisturizer as needed through the day and a second layer of sunscreen before I left work. By day 7 I was starting to look normal again my skin was looking fantastic! I had just a little bit of peeling at the edges around my hairline, eyebrows and under my chin. I was still feeling dry and at this point I was able to start using my own skin care again. I applied my favorite hydrating non-setting cream mask (Naturopathica White Tea Antioxidant Mask) and slept with that on my skin. By the next morning I felt back to normal and hydrated. Day 7 - I am still a little dry and flakey around my eyes and the corners of my mouth. But my skin it SO creamy and glowy! I have on moisturizer, SPF and a little mascara. This is a big deal for me because I have had these freckles since my teenage years which was 18-20 years ago! 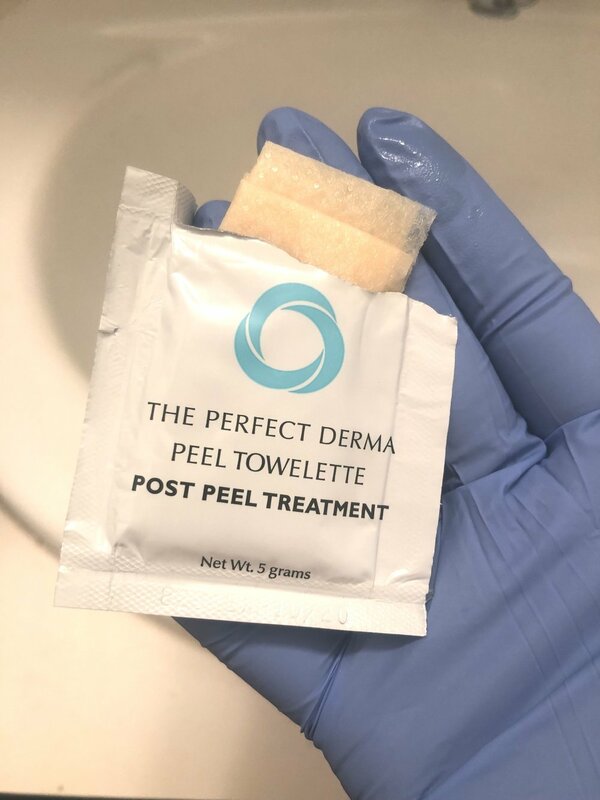 A peel as such this, performed every so often is a great skin refresher or sometimes you simply need a little bit more than home maintenance products can provide. This is especially true if you are trying to treat specific skin conditions. This peel in particular is safe to receive as soon as every four weeks or as needed. I plan on doing this twice a year! Overall, I would highly recommend this peel. It was a quick easy process and there were only a few days I felt the need to stay home. What I noticed with my skin was a significant lightening and fading with my hyper-pigmentation especially around my eye/cheekbone area, the few fine lines I had were softened, my skin was looked creamy and radiant, it felt extremely smooth and my pores look tiny. My skin care products are absorbing so much better and I have only been wearing a lightweight SPF tinted moisturizer. I haven’t had the need for foundation! If you are in the San Diego/La Jolla area and would like to give this peel a whirl here is Tina Marie’s contact information and her Instagram. You can also find a provider of this peel in your area on The Perfect Derma Peel website.